WHAT HAPPENED: Virginia struggled mightily in the first half, scoring just 2 points through the first 14 minutes. But the Cavaliers scored the final 11 points of the half, and took a 23-20 lead into intermission. A 7-0 run early in the second half gave Virginia a 35-24 lead with 16:57 left, and the Cavaliers would lead by double digits for most of the second half. 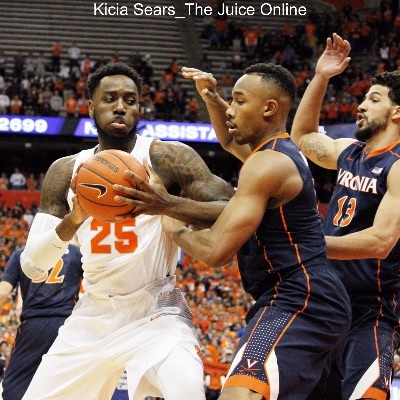 ANALYSIS: Like so many teams that came before them, Syracuse fell victim to Virginia’s style of play. The Cavs vexing defense suffocated the Orange offense into 38 percent shooting from the field and 4-19 from beyond the arc. On offense, Virginia consistently used the entire shot clock, poking and probing the Orange zone until it found a high percentage shot. Despite scoring only two points in the first 14 minutes, the Cavaliers ended up shooting 47 percent from the field. And like so many other games, Virginia completely dominated the glass, holding a 41-20 advantage over the Orange, including 15 offensive rebounds. HERO: London Perrantes was the catalyst for the Virginia offense, accounting for 10 of Virginia’s 13 assists on offense, while adding 10 points. Anthony Gill led all scorers with 17 points and chipped in eight rebounds, six on the offensive end. In his final home game at Syracuse, Rakeem Christmas scored 10 points and added four rebounds, three assists and two blocks. ZERO: For the first time this season, Kaleb Joseph didn’t start, nor did he see a single minute on the floor until late in the second half and the game already decided. His replacement in the lineup, BJ Johnson, didn’t play particularly well, though, finishing with three points on 1-6 shooting. 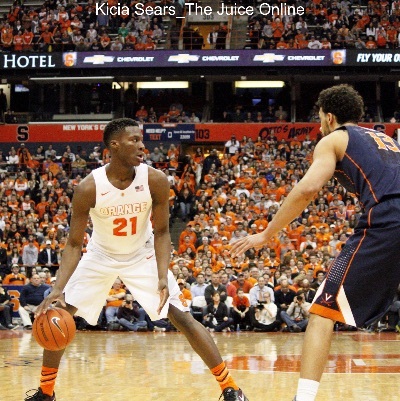 Michael Gbinije contributed to SU’s poor shooting, finishing 2-11 from the field. 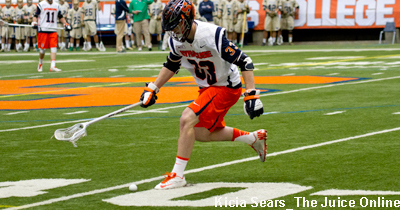 WHAT’S NEXT: Syracuse will conclude its season against North Carolina State on Saturday, March 7 at noon. TV: CBS.